One of the things I was a bit nervous about when it came to having a baby was still getting to go to 'cool' places to eat and drink. When you're not a parent, you don't really notice things like baby changing facilities or high chairs, so it was a total learning curve for me to figure out which places I loved before were date-night-only locations and which were Benjamin-friendly. In general, I have found pretty much everywhere to be as accommodating as possible when I've turned up with Benjamin in tow, and I've not had any huffy looks or loud tuts directed at me. But, some places are most definitely more baby-friendly than others by their very nature. I love independent cafes, but so many of them are small without a lot of space between tables to manoeuvre a buggy or you feel a bit awkward with a squawking baby when everyone else is trying to sit and enjoy their flat white in peace. Plus, sometimes you just want to enjoy those places on your own, if you can. If you've ever been to The Mustard Pot on a Saturday afternoon, you'll know that it's a haven for families. It was one of my favourite pubs before I had children, and I love it even more now. The beer garden is perfect for an afternoon in the sunshine, and the comfy sofas are great for a catch up with other parent friends, plus the baby changing is great. Avoid taking the pram if you're going on a weekend as it can get crowded inside, but you'll likely have no problem during the week. There's plenty of car parking, too. Oh, and they do an excellent Aperol Spritz. One of the most gorgeous buildings in Leeds, you get serious cool points when you opt for an indie cinema like this rather than a chain. On Wednesday at 11am, they have a 'Bring Your Own Baby' screening for just £5.50, including a free tea or coffee. They tend to have the more 'serious' films on show, but if you're a movie lover, this is a great way to keep up and stay entertained with a baby in tow. Very nice lunch with my husband at this deli in Headingley. Perfect midweek treat and lovely rustic decor. White's Deli have a great food menu (including giant slabs of cake) and a relaxed vibe that's perfect for a meet up with other parent pals during the week (although I'm sure they would welcome you at the weekend, too!). The halloumi wrap is particularly good, especially as you can eat it one-handed! This is the kind of place I loved to brunch pre-baby, so it's nice to still be able to do it in some capacity! Okay, tell me The Tetley isn't one of the most impressive buildings in Leeds? There's a sizeable car park next to it and plenty of room for a buggy in their cafe. I also love their terrace when it's sunny, too. They also do a free messy play session for under fives once a month, which I'm tempted to take Ben to soon. Whilst you can't bring in prams or pushchairs, I really like Seven as somewhere to hang out with a baby in the day time. It's never super crowded, and if you're lucky you can nab one of the sofas so you can spread out a bit. The baby changing facilities are really good, and it's a non-profit so you can feel good about a cheeky lunch time wine if you want one! Brunch Babies is go from 11am till 2pm in our basement. Grab a beer and while away the morning while your precious occupies them self with our mats, books and toys. Trot On! Whilst Friends of Ham isn't usually somewhere I would rock up with a baby, they do a Brunch Babies event once a month that's definitely worth going to. The staff are super friendly, and have on more than one occasion carried my pram up and down the stairs for me. There are toys out for little ones, and a full menu of deliciousness for big ones. Total winner. FRIYAYYY! Praying that the blue skies make a return soon 🙏 Blue skies or not though, this weekend is set to be a good one. I'm going into Leeds this evening to start sampling all the good food at @leedsindiefood and tomorrow I'll be doing exactly the same with a cheeky visit to Veg North to eat yet more food 🙌 CANNOT WAIT. What are you all up to this weekend? If you're looking for plenty of space, then this is the place to go! The food hall at Kirkgate Market is one of my favourite places to pop in for lunch as my office is nearby, and it's great when you have a baby with you, too. There are plenty of choices for food, and it's noisy already so you don't have to worry if your baby starts making a fuss. Get yourself a shawarma sandwich from Istanbul Bakery and thank me later. See above re: Kirkgate Market for all the reasons why Trinity Kitchen is a good place to hang out with a baby, and then add the proximity to the great baby changing facilities in the shopping centre to the list. The steady rotation of street food vans alongside the regulars keep things interesting, and you can always go and browse the shops after lunch, too. This is a bit of a bonus one, really, because it's only on during the summer but the uber-cool Eat North at North Brewing Co is back this year and I know we'll be hitting it up as much as possible. Essentially a mini street food festival at a brewery, they're very explicit that kids and dogs are very much encouraged, which makes it my kind of event. Who doesn't love a pretty local coffee shop? No one, that's who. Scandinavian-inspired design, cakes from Noisette Bakehouse, cold pressed juice and Instagrammable scenes for days. We went to Stories on their opening weekend for coffee & cake, but I was very jealous of the dippy eggs being eaten by the couple next to us so I am definitely going back for brunch sometime very soon. We ended up in Mr Nobody on a night out recently, and their Wye Valley Spritz is the cocktail that I'm now dreaming about on warm days. There's a lovely little garden outside if the sun is shining, and the inside has some fun little pods to sit in. We just went for drinks, but apparently you can grab a pizza with your drinks and (most excitingly of all) they serve up a tasting menu downstairs that sounds pretty amazing. This aptly named bar is right by my bus stop, and my daily peek in the window definitely makes me want to visit. Unfortunately, circumstances haven't conspired to get me through the doors yet but I know it will only be a matter of time. 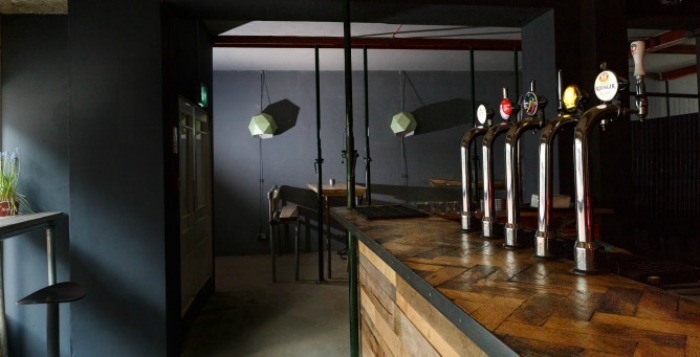 It's a multi-purpose venue serving up food and drink alongside art and music. The building is really unique, and it's so nice to see it being used at last! Kebabs get a pretty bad name. Usually the foodstuff consumed on a night out to satisfy drunken cravings, I Am Doner is giving the kebab a makeover and making it the dish every foodie is going to be talking about. Their house special combines slow-cooked lamb, super juicy chicken, falafel and halloumi with salad, feta and various pickles and other deliciousness all wrapped up in the softest bread. It was a flavour sensation and I already want another one. A few years ago, I was lucky enough to dine at The Pink Shed, catered by La Casita in Ilkley. The tapas was completely delicious, but I've not had a chance to experience it again. Now they've moved to Horsforth - just up the road - we'll definitely be taking a trip for a little Iberico pork cheek and Rioja.